The SoCal Buttercup Jewelry Shelf is the ultimate hanging jewelry organizer, ready to store hundreds of jewelry pieces, keeping them tangle-free and ready for easy access! Made of high quality hardwood with a rustic feel. It comes in a retail ready box that you would see in a high end home supply store. The Jewelry Shelf includes wall mount screws that make installation a breeze. No Assembly required. 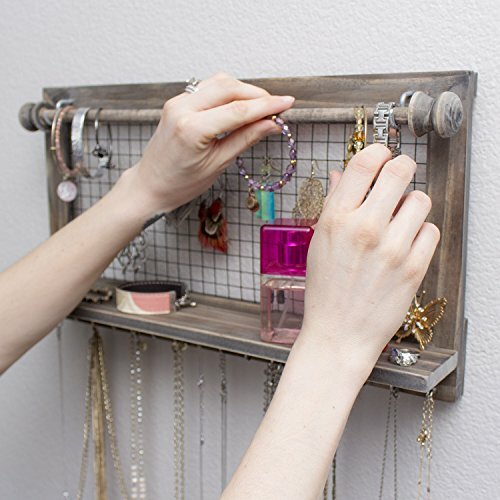 The sturdy shelf gives plenty of room for bracelets, nail polish, stud earrings, and perfume. INGENIOUS DESIGN: Organizes earrings, necklaces, bracelets and accessories to keep your jewelry tangle-free! BEAUTIFUL APPEARANCE: High quality rustic wooden design showcases your jewelry in style READY TO HANG: Wall mounting screws and anchors included for easy quick installation. No assembly required. PERFECT SIZE: Designed to fit on your bedroom, closet, or bathroom wall. 17.5" x 10" with 3" shelf and 16 storage hooks. CUSTOMER SERVICE: You Love Them Or Your Money Back For Life - We Keep Our Promises To Our Customers And Treat You Like Family!